There are less than 150 spots remaining in the KELLY St. Patricks Day 5K in Baltimore. If you want to run, send in your application TODAY or go online and register via Active. 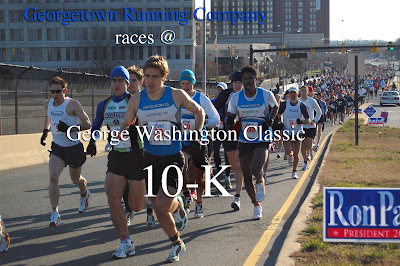 Enter "Georgetown Running Company" as your team name. after 13 comments on the blog I cannot figure out where people have decided to run on Sunday. I would prefer variety with some hills and such. I say we meet at the line and go from there. people can run whatever and meet back at the cars and then get coffee at starbucks. joe, you can come and run on trails as I am sure someone else will want to join you. I think this should be a very controlled run. Maybe start off jogging for a bit and gradually build into it. considering everyone will be hungover from the night before, this might be the most reasonable route to take. Melissa turned 27 on Tuesday! To celebrate we are going to Bossa Lounge in Adams Morgan on Saturday night. I hear this is a more low key venue...considering it's on the AM strip. She would love it if some of your GRCers can stop by (if only for an hour) and say hello. We'll plan to get there around 8pm. Melissa is also bringing some of her "babe" friends from American Univ. Hope to see YOU there. Please send me a confirmation e-mail today indicating you want to be on the team for st. paddys day race. Does not matter whether you are an elite racer or not, just send me your name, address and you know the drill. Watch this at lunch. There are some great moments...all of them falls! The angle/shot changes each minute or so. and be merry. I have been reading some people's training logs and of course, have witnessed some injuries and tiredness and such. I know I sound like a destroyed record but folks, PR being the exception, would do well to really focus on flexibility, stretching and developing the core. I was at the gym last night, in a stretching class with beautiful women(besides the point). Bottom line, is after an hr.of active isolated stretching i felt like a new man. You guys are running hard. You need to spend as much time keeping the body limber as you do running. I bought a rope and fitness ball for the office. I stretch, and do core work in the CUBE. This makes for efficient workout. Work and workout at the same time. There will be a run from the store this weekend at 8:30am sharp. Usual run of 8-10 miles at moderate pace. On Sunday there will be a 18-21miler( 2hr plus run). I suggest something different this go-around. Of course, i am not sure what. I will throw out something along the lines where we start from the MD/DC line and go down Beach Drive until we hit Pierce Mill. We then circle back and run up Ross drive and encounter major hills. We run back to the Nature center and then back to Ross drive where we continue until we hit Beach drive again. We run along Beach drive and then veer left on a paved road that takes us into Chevy Chase/Silver Spring. We then run on the outskirts of the park and slowly circle back to the line. This is less than 18 but is filled with hills. For those that want more they can add on. Just an idea. PS. please invite others to these runs. They do not have to be elite runners but simply people looking to run with others and have fun. The more the merrier. Watch his finishing kick in this video. I might be wrong but I believe Melissa is running the B&A Marathon this weekend. Its on Sunday. Its her last chance to make the trials. I would be willing to try and pace her. others? While wasting my Sunday away, I came across this YouTube user's vast collection of running videos (466 total). Just finished up watching 1985 documentary "Supermilers". Anyways, check it out if you haven't already. I spent some time fixing up the blog this weekend...the things you do when you can't run! PHOTOS - I started a slide show but I need more pictures to put up on it...so if you have any, please get them to me. I put every picture I had archived but I need more. I'd prefer to download them off a link rather them being e-mailed to me. GEAR - I added the GRC men's standards for shoes and gear on the right hand side of the blog. These standards were established after long talks, meetings and back-and-forths with various members of the team. If you've run any of these times in the past 6 months, are not injured (ie - currently training/racing) AND show up regularly to GRC runs (weekday and/or weekend) you will be eligible for some gear and a store discount. See Ben next time you are in the store for additional information. Those who have not hit any of these times BUT show up to group runs and are committed members to this team will also be eligible for some perks at the discretion of Ben and GRC management. Obviously no one is coming out for group runs in order to get a free long sleeve, but the gear will help ID us at some of the bigger area races. I've been informed that new gear (including singlets for everyone who shows up regularly to runs) has been ordered. Apparently there is a huge back-order and it will take some time before it arrives. Hopefully we get it pre-St. Patrick's Day, but it should be here before Cherry Blossom (where it looks like we'll have a huge showing). We currently have only a small handful of women. Once the roster grows, we'll create standards here too. Same with masters and age-group runners. At the moment 90% of those who show up for team runs are 20-something males. GROUP RUNS - in an effort to "bring this back to the store" we'll continue to meet at GRC every other Saturday. The other Saturday we can meet at either the store or at any location. POSTING - any/everyone can post so long as it relates to running and team-related stuff...so post/comment away. E-mail me if you need to be invited. P. Reaves and I met up for the Club 10M Challenge this brisk Sunday morning for what was to be a nice, steady tempo run, just under marathon pace @ 5:40/mi. We tacked on a 4mi warmup and cooldown to make it a nice 18 mile Sunday run. Since we were not counting it as a race, I figured it was OK to forgo my usual race attire and wear a shirt. Good thing, because I don't think it had quite reached the freezing point at race start. Reaves and I ended up running together for much of the race. At the beginning, it was a struggle to hold back--we were so close to a pack of 5 or 6 runners near the front, and it was tempting to go with them. The first mile (if you can believe the mile markers...) was 5:23, and we decided it was a little faster than we wanted. We settled down a little, and after missing the second mile mark, we hit mile 3 at 16:24 (interestingly enough, this was 5 seconds faster for me than mile 3 at the 10K last weekend--go figure) and felt really comfortable. At this point, we were in the top 10, with the pack still visible up ahead. The halfway point was 27:30 or so, for a 5:30/mi average, still feeling good, not like a race. I didn't catch every mile--Reaves I think has them on his watch--but I'm pretty sure several of the markers were off. Mile 6 was very tough and hilly; I definitely pushed it too hard and sapped a lot of energy from my legs. I fell off pace a little at mile 7 while Reaves kept on. Together, though, we began passing stragglers off the pack. It's always a good feeling to be moving up this late in the race. For me, the last few miles were tougher than I would have liked, but I was able to keep a reasonable pace without feeling like I was going all out. We cruised it into the finish, with me a little behind. The unofficial results had Patrick at 6th place (55:42) and me at 8th (55:48). Not bad, 5:35/mi overall--pretty close to the effort that we wanted to put in. For me, I relearned/reinforced several things to keep in mind when racing longer distances: 1) It is very hard to hold back at the beginning, but it is a must in longer races like this; if I was truly racing today, I would have gone almost as slow as I did through the first half. 2) I need to eat before a race of this distance, especially since I ran a 4 mi warmup (today I didn't eat, and I felt the lack of energy the last mile). 3) I shouldn't blow myself out on hills in the middle of a race just to keep on pace--I would have been better off dropping a few seconds on mile 6; I probably would have made up the time (and more) at the end. Guys, I am not hurt but a bit beat and mentally burnt right now. Nothing killer but just need a few days off from running hard. Its like marriage, there are the good and bad days and all of the days in between. Great thing about running is one can simply ignore the sport for a few days until the love is rekindled. Not so easy in marriage. i think i will skip the race tomorrow and just chill out and do some kayaking or a hike and enjoy some peace. Terrel Hale, A massage therapist who specializes in helping runnners, will be providing some free massage and education about the work he does tomorrow from 4-6 at the Chevy Chase store location. If interested in getting some work done and asking questions and getting some feedback on the potential bennefits of sports massage, stop on by. there will be a run from the store on Sat morning at 8:30. I may or may not be there. Jake is a no go but someone else should step up and take the lead. Sunday is a wash, I think, as a group is racing in Columbia, Jake is still on the bench and I have not heard a peep from others. I'm running the LA marathon next weekend with my girlfriend and need your help. It's her first marathon and we'll be shooting for 4hrs. As some background, I'm a 2:48 marathoner and have completed 4 in the past 2 years. I also ran middle distance in high school and college before getting into marathons. She has been running since high school on a more casual 5k/10k basis, completing a half marathon last year in 1:50. In other words, she is very new to this distance. I've done her 16-miler and 20-miler with her, so I have a glimpse into the emotional/physical pain she'll be in towards the end. My plan for race day was to not register and jog alongside her. I'm doing a marathon of my own in late March, and really don't feel like paying for this one on top of that (Side note: I'm also flying from the east coast and am getting a hotel room because I'm not allowed to stay in her sorority house). I didn't think running with her would be a problem seeing as some big marathons like Boston don't care who is out on the course, but the LA marathon website states that unregistered runners will be escorted off the course. 2.) What is a good walking break strategy - how would a first-time 4hr marathoners usually break up their walking? I've advised her to shoot for a minute of walking every 30 minutes, and one every 15 minutes past 20 miles. This is what she's practiced in her long runs. 3.) What can I do during the marathon to encourage her/take her mind off the pain? The past couple long runs when she started slowing down I think I've come across as slightly agitated and not supportive. On marathon day I want to be as helpful as possible. For those interested in regaining status in the Washington Running Community as top team, the St. Paddy's day 8k is the time for it. We will let you know within the week about whether we can grant you a comp entry. This time around, those who are running fastest get in for free. Others might have to shell out some dough. Either way, the team runs as a team. 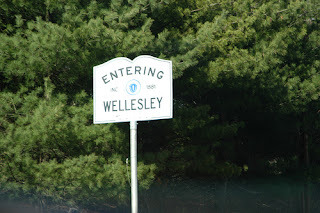 For planning purposes we are located in Montgomery County, MD approximately 25 miles north of the District of Columbia. Reagan National and Dulles are within 30 minutes while BWI is within 45 minutes of the course give or take with our famous traffic tie-ups. Most likely the headquarters area will be located in Gaithersburg, MD. I will pass along updates as we progress forward towards the 2009 US Cross Championships. Sorry, for the earlier confusion the entire area is considered the Baltimore/Washington metroplex. I also want to commend Thom Hunt’s Crew and the USATF for a job well done in San Diego. I will follow and expand upon Jason's topic. Granted an 8K is 10 times his normal race length and he was probably just taking it easy to help his team qualify, but a win is a win. So I'm pretty laid up... and woeful thoughts have been prevading my mind... so I have been flipping through so old race results going down memory lane. of the nearly 29 years I have lived, 15 have been competing. Anyways, it is nice to know it is a small world. No idea who you guys were, but you were already there with/for me. This must have been a lean at the line. After a few weekends of hard running it appears that the war against becoming a couch potato or regular shmoe is taking a toll. People might be getting tired, fatigued, injured, etc. Running hard simply does more harm than good to the joints and leg muscles. How to maintain and keep it fun is the key. I am in no way trying to sell massage therapy to people but I will say that it does little harm to try it out and see whether it works for you. If we can get a group or say, 3-5 people interested, I can talk to a local therapist to see about getting a special group rate. Furthermore, we can set it up for Saturday and have it conducted at the store in Chevy Chase. Just an idea for now but I am sure you all know that regular massage and breaking up of scar tissue and getting quick and immediate blood flow to damaged leg muscles is one of the best ways to keep the engine in solid working order. On a more humorous note------ I read Allen's running blog. He is making a claim that at age 24, he is done, through, had it, etc and he is retiring. The old man is going on to drinking and carousing and finding himself. Good luck Allen. As soon as you get bored of this new journey you can un-retire and come back to running. FYI------I noticed that the first race of the RACE PACKET RACE SERIES takes place this weekend. Race Packet is a local running publication that sponsors a little local race circuit. If you participate and win, you get $500. Most people on the team can win if they focus on the key races. The first race is the RRCA club challenge this weekend and then there are about 9 others throughout the year. If you pickup the local racepacket magazine at a race, all of the races are listed. The magazine is also at the Georgetown Running Company store. The field size will be limited to 25,000 athletes. Entries from athletes meeting the qualifying times will be accepted until the maximum field is reached. Well, for those not in the know, myself, Chris, Matt, Michele, Kelly, Lauren and some others busted it out at Chief Ike's Mambo room last night. Back when I was in preschool that was a spot I would go to for a night of random nuttiness and good music. Last night did not disappoint. There was good music and atmosphere and plenty of beer. At some juncture of the eve, all were in full bloom and dancing away. Matt Ernst looked like a man possessed as did Chris. Allen had his thing going, hands in pocket and all. In all, it was a memorable eve. I left early so I am hoping the rest of the crew made it back in one piece. My legs were and are tired from a two day period of no rest and much standing, dancing and running. None the less, we ended up doing about 15-18 miles with some of the guys tacking on a few more at the end. Nice run and lots of good discussion and such throughout the run. Taking tomorrow off from running and hitting the gym for weights and stretching. Below is a map/location for Sunday's long run. We'll depart at 9:30am. I believe the distance will be 18...others may go longer. Click on the "B" below to get directions. Just for my novice interests. What do you guys do the day before you race...ie, did you/will you run today and how far since your racing tomorrow morning? I am not sure what people have going on post race eve(sat). However, I have spoken with Allen Carr, who is looking for love in all of the wrong places:) Sorry Allen, but its true. Anyway, Allen along with myself and Michelle Sikes(who is visiting from WF) want to party. Location will be either Adams Morgan or U St. Area. Others can and should come and join the fray. Are all on the list racing for certain, this weekend? I am making final roster now. Klim is the only ? due to knee trouble. Others? let me know asap. Also, there was a last minute glitch with the fee. Instead of getting in comped, we might get a 70% discount and have to pay $10. Not 100% sure yet. Will let ya know soon. Also, Jake made a good suggestion which is, lets meet-up(Allen, thats your phrase man) as a group for a pre-race bonding session/warm-up. I plan on getting to the packet pickup at 7:45am. I suggest we meet at the pickup spot at 8:am and then head out for a 1 or 2 mile easy warm-up. At this point, we have an army of a team racing, so the mere sight of us might be enough to disable the competition. Speaking from experience on the injury front, I can only re-emphasize the CHILL term. Unless you are Michael Wardian, you will break from the running addiction. I have seen the best runners in the area die off one by one due to injury. They peak in their late 20s and then, boom, something happens, and by their early 30's they are a mere shadow of their former selves. There is always the exception such as Hage, Moeser, Rolly, etc. but these are by far, the few and lucky. Jake and Reaves and others are running great. However, some are putting in miles similar to what the pros do. Unless I am missing something, very few of you if any really take time to do the body maintenance thing such as go to massages and Yoga and all the things you might think are lame or not important, you do not have time to do, etc. All of the pros who put in the megga miles and train hard do lots of the maintenance to keep the blood flowing and the muscles limber. Think of your bodies as being really expensive cars(the best). They need to be oiled, tuned and pampered to run smoothly. My knee pain is on the inside of the top "ball" of my left knee. I felt it 2 Fridays ago while walking around after my run and I can't seem to place how/when it started...but it wasn't something that happened (at least that I felt) while running. I ran over the last two weekends fine but last Monday morning, when I woke up, my leg was stiff. I tried to run, but decided it was best to take the day off. I iced and Advil-ed. Last Tuesday the knee felt better and it warmed up quickly...it was a little worse on Wednesday morning and about the same Thursday. Fast forward almost a week later and I still have the pain...not worse nor better. It warms/loosens up after 30 minutes and I can still push hard, but my guess is that I don't want to aggravate it. I've been icing 2x a day and using heat pre-run. 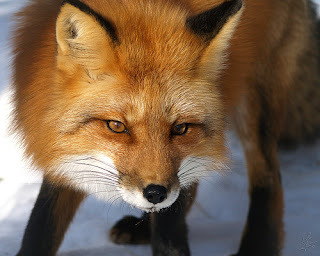 The pain is more severe in the morning when I wake up (no movement for 8 hours?). It almost feels like I banged my knee against something and bruised it...and I don't think that happened. If I lift my leg up and down (bending at the knee) there is sometimes a slight pop. Again, I can run, but it can be a bit distracting. Any thoughts on what it might be or what I can do - someone on this list has to have had this pain before.? I seem to notice more today (Tues) and I will likely take two cautionary days off and see how it feels come Friday, but I invite feedback in the comments below. Thanks in advance. Bottom line, I really miss running... I was at a low point prior to this set back where running was becoming a chore... I almost feel that this injury was a gift of regeneration. My core strength and muscular strength/endurance have been strengthened more than ever before due to concentrating my energy into this neglected part of my fitness from before. From looking at the previous blog postings... I see a lot of you are really putting the hammer down. I think it is awesome that many of you have been running together. The miles you are putting in are consistent and the quality days look like they will really pay off for the marathon. Keep up the good work... I hope to come out and meet the members i have not met yet... possibly run part of one of your long runs with some of you, just to get out in 4 weeks or so. As mentioned below, the run yesterday was great. Incredible group and intense run. My only advice is to take it real easy after a run like that. Even if you feel good. Take some time off and let the micro tears in the muscles heal. Protein and blood flow and lots of raw veggies will assist in this effort. Massage therapy and a yoga class, maybe? Case in point. After the run, Murphy dropped me off at my gym downtown. I did some stretching and some sets of free weights(light weight and high repitition). Felt fine. Walked a bit and stayed standing for several more hrs. Around 3:30, i felt my heel just kind of fall apart. It got real inflamed and then sore to the point I had to cab it home. Got home and stuck the foot in an ice bucket for an hr. It was like putting a burning ember into some cold water. Totally bizar. Anyway, eventually the fire was extinguished and it seems to be fine now. Lesson is_______Should have gone home after the hard workout and soaked in a tub of ice and then rested the wheels. On a side note, the run yesterday tells me that Jake, Chris, Jason and big Reaves should all run 2:30 or under for the marathon. I am certainly not there yet and might not get there as I am fearful about putting in the necessary effort to take that next step. Will see. Enjoy the beginning of the week. Vote with your hearts and not conventional thinking. 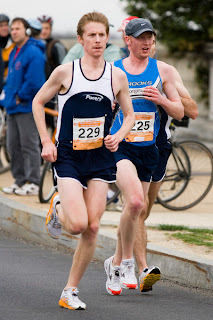 I am doing some local DC roadrunners race this sat in Bluemont Park in Arlington. Its a 12k and I will use it strictly as a tempo since I have not done one this week. Probably 6 minute pace at most. I know next week many of you are doing the GW1oK against the vaunted Pacers. Susannah suggested that she, myself and one other run the Georgewashington marathon relay race the next day. 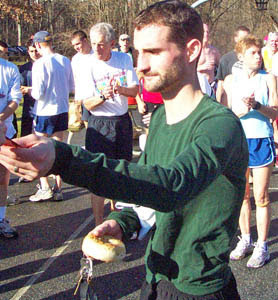 If I did this I would skip the 10k. In any case, Jim Hage and Luke Merkel's parents have the record of 2:36, that dates back to 1989. I think each person needs to run about a 5;55 mile over 9 miles to get best their mark. This is very feasable. In any case, if someone out there is interested, this is a chance to make history. You guys and gals who want to make this thing work, please send forth your ideas and such. This is not dictatorship or a Jake or Max or whoever, thing. We are just trying to keep this running group going and get a little support/love along the way. There is lots of talent and drive here so lets not let it go by the wayside is my motto. Since this is a hobby for most if not all of the folks here, lets put it in perspective as such. In other words, have a club/team that supports quality running for the working joe runner. What type of infrastructure and such needed to make this happen is developing. Upon some brainstorming with folks about the team/club concept, one piece of criteria that needs to be met for being part of this outfit is to provide me with a one page outline of your goals and subsequent plan of attack to meet them. I will compile in a MS Word document and send back out to everyone for reference and pleasant reading. Jake Klim sent me a nice and sweet synopsis of his current training plan and what he hopes to achieve in the upcoming year. He lists training and times he wants to meet per distance. He also provides a nice paragraph explaining what he wants to do with the team/club, why he values it, the role he wants to play, etc. If you need an example to follow, you might have him send you his plan. Jake, myself and others have been trying to figure out a way to bring a fun and loose structure to this club/team that addresses the vast array of talent, age groups, and goals across the big group that we have. So far we have come up with two items that we think are a must for being part of the crew. As you know, one is attendance and two, is having all who are serious, provide a written goal that, upon completion and submission, you will be held accountable for. No, we will not come to your house in the middle of the night and do you bodily harm if you do not live up to the standards you have set yourself. The Goals you lay out provide you and the team with something concrete to live up to. Your team-mates will also have access to this and can provide support and guidance towards meeting these goals. Of course there is the group support and friendship, improved running, etc. piece but yes, there will also be prizes to be had. To be honest, I am not sure exactly what they will be and for what type of performance, but yes, for those that work hard, show up, improve and yes, provide some love, rewards in the form of shoes, race entries, gear and more will be provided. We are working on establishing the standards that must be achieved in order to get rewarded. I hope this makes sense and people are cool with the PROVDING YOUR GOALS to me request. please do so within the next 3 days. I need help setting up a schedule to follow in preparation for Boston. I've broken it down into an 18 week calendar...starting just after XC Club Nationals in early December. I am currently on week 8 and have averaged 70 mile weeks for the past 7 weeks (that includes two 50+ mile "junk" weeks I did when I went skiing). I feel fairly comfortable at 75 mpw and plan to "up it" soon with doubles. My typical week - 10 miles every weekday morning (sometimes 9), 10 on Saturday and 15-20 on Sunday = 75mpw. My simple plan is to start increasing some of my morning 10s to 12 and then start doubling up and adding mileage that way. I'd like to peak at 100 or just over and would like to plateau btwn 95-100. My big question is how many weeks should I try and hold this plateau and how far back from "Marathon Monday" should this be? I feel very strong and feel like I will be very ready. The long runs feel quite easy compared with those I did last year. FYI - week 18 is the week (M - Su) before the marathon. Week 19 would start on race day. I WOKE UP ON SUN AND MY ANKLE WAS THE SIZE OF A GIANT BALOON. HUGE AND PUFFY AND WICKED TENDER TO TOUCH. ANYWAY, I SUBMERGED IT IN ICE AND PRAYED TO THE GODS AND IT SEEMS TO BE DOING BETTER. HOWEVER, I ALMOST BROKE/TWEAKED IT AGAIN LAST NIGHT WHEN I KICKED THE GUY NEXT TO ME AFTER MANNING THROUGH THE FINAL TD. PATS AND HISTORY ARE ALL FOR NAUGHT. BRADY RULES AND THE PATS WILL BE BACK. Jason Dwyer, seen here winning the Nobel Peace Prize in 1989, ran a 15:27 at the Haverford Indoor Meet on Saturday. Unfortunately the race wasn't as competitive as last year and he ended up leading the race for 2 miles. Nonetheless a solid effort! Max, Reaves, Bain and I met rival PACERS Bert and Steve Crane at a nice blue stone path on Saturday morning. The trail was as wide as the Canal towpath and meandered around Buddy Attick Pond near College Park. The loop was 2,040m...or just over 1.25 miles. Bert, Crane and I ran 5:20 pace for 4 laps ...actually Crane kept the pace up for a 5th lap (6.4miles). Reaves, Bain and Max followed. Max busted up his ankle somehow on this flat path. We ran a total of 11.5. On Sunday, Reaves & Bain met again and headed down the Greenway Trail towards Derwood. Melissa and Nate Timm ran together just a bit behind. 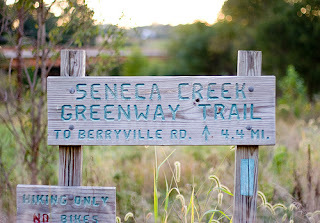 The Greenway Trail rolls up and down along the Seneca Creek all the way from the Potomac to the Patuxent. We went up and down muddy paths, over brooks, through giant fields until we reached Black Rock Mill in Darnestown...wherever that is. We turned around and cruised at a solid, yet comfortable, clip back to Riley's Lock and then turned left on River Road and hammered up a long hill a la Boston's "Heartbreak" and in doing so passed some a few guys on bikes. We whisked (running out of words here) down to Violettes Lock Road and pushed the last steep hill on our route then eased home along the Canal Towpath. A solid run that brought us through trails, roads and towpaths. 18 miles in total. UPDATE: Next SUNDAY is the planned Sycamore Landing Rd to Old Anglers Inn run. We'll be running 2 miles on, 1 mile off for 12 miles at a little faster than marathon pace. I need some photos of runners(you and me and others you know), running with each other. I need these for an article I am writing about the group/team/ running. this is your chance to be famous. WHERE IS LITTLE MUNRO AND MIGHTY MATIAS? Scott, do not tell me that the life of Actuary science is so encompassing that all you do is work, drink beer and watch re-runs of the Steeler's glory years? Though there are no by-laws or rules and regs for this club/team we are playing with, the absolute must, in order to get some goodies out of the deal, which, includes free entries into races, is that YOU MUST show up to at least 80% of the group runs or one per week. This can weekend or weekday workouts. Its more about team spirit and developing a cohesive and responsive group than simply being a speed demon and showing up once and a while to race for us. There is always the exception such as for injury or personal matters of utmost importance. Other than that, regular face time counts for much. The context for this message is that I have received lots of requests to get into races for free, etc. This is fine. However, there needs to be some bar set for this. Simple and reasonable request is to show up to the group runs, strive to get stronger and be a positive force.